September 12, 2016 – You may not think about insulation much, but it’s one of those unsung industry heroes that keeps our drinks cold and homes warm on those bone-chilling winter days. Insulation also is a key component to protecting NASA’s Space Launch System and its super-cold fuels for the journey to Mars. Different types of cryogenic foam – used for very low temperatures — will insulate the rocket’s core stage and launch vehicle stage adapter, which connects the core stage to the interim cryogenic propulsion stage (ICPS). The core stage is the backbone of the rocket, and houses the avionics system, propellant and RS-25 engines. On the first flight of SLS with the Orion spacecraft, called Exploration Mission-1, the ICPS will give the Orion the big push needed to fly beyond the moon before the spacecraft returns to Earth. The rocket’s fuel is comprised of liquid hydrogen and liquid oxygen. Liquid hydrogen is cooled to -423 degrees Fahrenheit, and the liquid oxygen is cooled to -297 degrees Fahrenheit. Insulation protects the outside of the core stage from ice build-up resulting from the subzero propellants inside the aluminum walls. Insulation also reduces heat flow to the propellants, hardware and flight systems during launch and atmospheric re-entry. So, what kind of insulation materials can measure up for the world’s most powerful rocket? Engineers at NASA’s Marshall Space Flight Center in Huntsville, Alabama, are peeling back the layers to find out. Three types of foam have been developed and are being tested for SLS. The foams are all closed-cell materials, which means they are stronger and have greater resistance to heat flow and moisture. They also are non-ozone-depleting and flame resistant. The different types of insulation are applied by varying methods: automatically by a robot; manually using a hand-held spray system; and hand mixed for pouring into molds. “With some parts of the rocket being so massive, like the core stage, robotic applications help reduce time and manpower with more control and continuous sprays,” said Amy Buck, SLS core stage insight lead. The thickness of the insulation varies depending on the hardware, but it is typically about one inch. 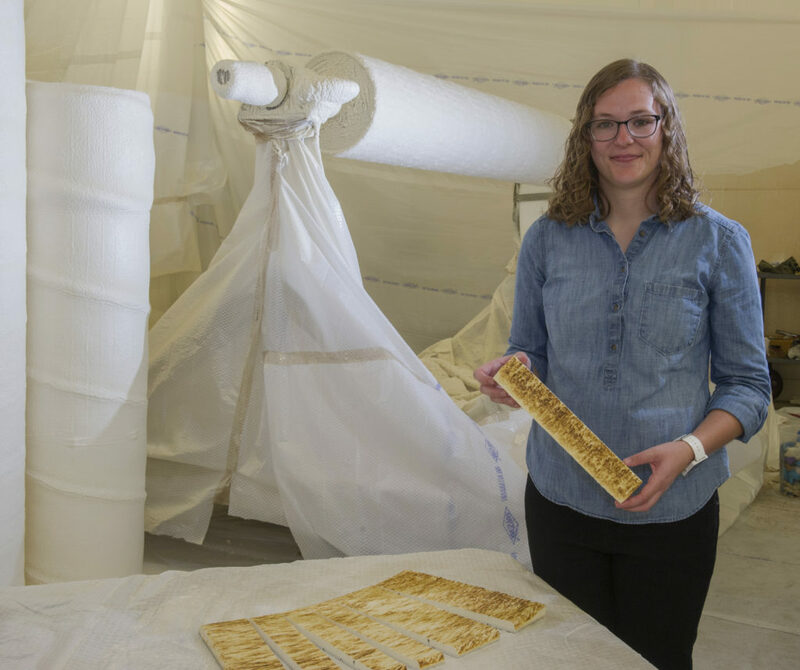 Hundreds of 24-by-24-inch panels have been covered with the three types of foam for a variety of tests, which are being conducted by NASA and prime contractor Boeing, headquartered in Chicago, to qualify the insulation for the challenging environments SLS will experience before and during flight. Tests range from density measurements to exposing the foams to heating environments similar to those the SLS will see during ascent. Qualification testing of all the foam systems is anticipated to be completed later this year. At that point, the materials will be ready to use on Exploration Mission-1 in late 2018. “There are some follow-on aging tests that we will run over the next few years, but those are just being done to ensure we don’t have any problems with long-term storage of the cured-foam products,” Frazier said. So the next time you reach for a drink inside your cooler or shed the cold of winter in your home, think about another type of insulator that will be headed to deep space. The initial SLS configuration, known as Block 1, will have a minimum 70-metric-ton (77-ton) lift capability. The next planned upgrade of SLS, Block 1B, will use a more powerful exploration upper stage for more ambitious missions with a 105-metric-ton (115-ton) lift capacity. Block 2 will add a pair of advanced solid or liquid propellant boosters to provide a 130-metric-ton (143-ton) lift capacity. In each configuration, SLS will continue to use the same core stage and four RS-25 engines.